The Rolls RM82 Mic/Line Mixer is an eight channel mixer in a single rack space intended for a variety of sound reinforcement applications including board rooms, churches, mixing console expansion etc. Virtually any application where up to eight microphones need to be mixed together, and space is limited, is met by the RM82. 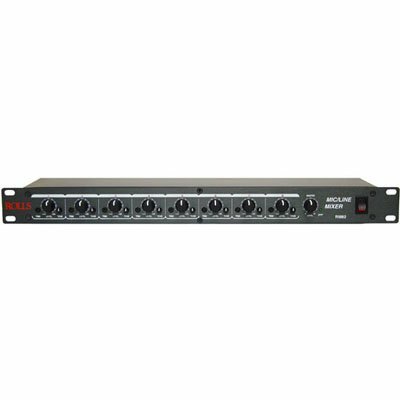 Each of the eight channels has an XLR microphone input, as well as a 1/4" unbalanced input. The 1/4" jacks may be internally reconfigured to become channel Inserts or Direct Outputs. Inserts provide a way to get each individual channel signal in and out of the RM82 mainly for processing purposes. A Direct Output is simply taking the signal from the channel only. Each channel has individually switchable +48 VDC phantom power. The RCA Prefade (pre Master Level) Output may be connected to the RCA Aux Buss Input for cascading two RM82 units together. This Output may also be used for recording purposes, and the Aux Buss Input. The Main output for the RM82 is a balanced male XLR jack. This output may be internally jumpered for a Line or Mic level.